or the serialisation of A Tale of Two Cities, the eleventh of Charles Dickens's novels (and only his second historical novel), Dickens's perrenial illustrator, Hablot Knight Browne (otherwise, "Phiz"), designed a monthly wrapper that underscores the dualities implicit in the title. 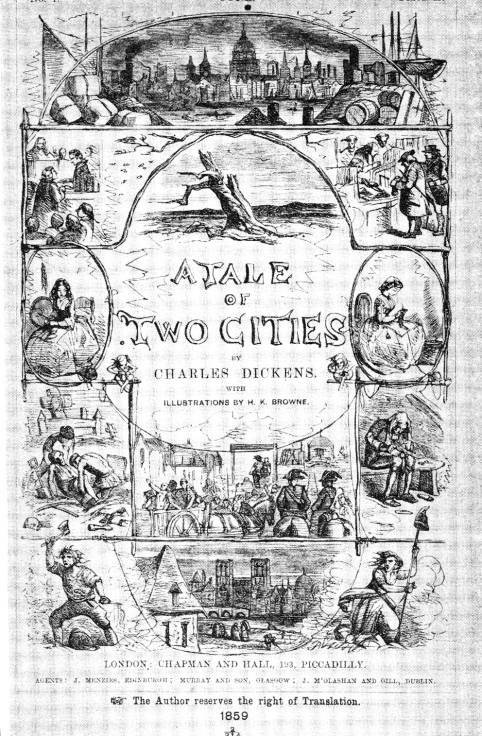 A significant carryover from his previous work for Dickens is the allegorical design on the wrapper (reminiscent of the designs for such earlier wrappers as those for Martin Chuzzlewit, 1843-4) for each of the monthly parts shows scenes from the novel between vignettes of London (top) and Paris (bottom), indicating that Browne had probably read the story in manuscript prior to June, 1859, or at least had received a highly detailed account of the novel from Dickens himself. The top register contains St. Paul's, the Thames, the spires of Wren's late seventeenth- and early eighteenth-century city churches, and bales and barrels suggestive of marine commerce "but just below this, a tree killed by a storm. Across the foot Notre Dame, the Pont de Double and Quai St. Bernard" (note to The Pilgrim Edition of the Letters of Charles Dickens, Vol. 9: 35); the bottom register's Notre Dame is flanked by symbols of violent revolution, a hatchet-waving male and a pike-wielding female Jacobin, "tumbril and guillotine above" (note to Letters Vol. 9: 35). As Cohen comments, the reader should regard the two cathedrals, in contrasting Gothic and Neoclassical styles, as social symbols or emblems of national character rather "than actual locales in the narrative" (118), although they may also be regarded as reinforcing the religious note sounded frequently in the text and especially in Carton's closing speech. Lucie Manette (right: the dutiful, loving daughter) appears opposite Therese Defarge (left: the vengeful, hateful sister), the pair both knitting (although Lucie's domestic work will be revealed to be a contrast to Therese's patiently augmenting her secret record of those upon whom she intends to be avenged). Two men disinterring a body in a graveyard at lower left appropriately balance the scene with Dr. Manette, the Bastille's shoe-making inmate (lower right) recalled to social life after years of being buried alive; and the culminating journey by tumbril to the guillotine under the title, center. The "golden thread" (of which Dickens speaks in the text as one of love rather than of vengeance) connects all six scenes in the lower register, perhaps reflecting how the love entangled and twisted by hatred (as is the love of Therese Defarge for her dead brother) can be almost as powerful as that animated by self-sacrifice and loyalty (as ultimately expressed by Sydney Carton). "As usual, the cover was intended to excite expectations without giving too much away; by the time it appeared [in monthly form], Ch. 1-6 had been published in AYR"(note to Letters, Vol. 9: 35). Month by month, the reader of this ‘second serial' version of the novel would have augmented and adjusted his or her interpretation of those wrapper scenes as further pieces of the narrative puzzle fell into place. All the elements of the simultaneous, backward-forward reading and re-reading of a Victorian illustrated novel are present in the monthly instalments: anticipating the moment in the printed text that the pictorial accompaniment has attempted to realize; attempting to integrate details of the letter-press with those in the corresponding plate; and later reverting to a plate when another of similar composition appears. The smoke (suggestive, perhaps, of the dark tales of the Defarges and the St. Evrémondes, and of the forces of repression and revolution that animate the bottom register of the wrapper) from the Southwark chimneys, downstage right and left, blows symmetrically from the southeast and southwest, casting a pall over the City, dominated by the dome of St. Paul's Cathedral (designed by Wren, and built between 1675 and 1711). In contrast to the twin, square Gothic towers of Paris's Notre Dame below is the Baroque-style dome of St. Paul's, crowned by a lantern, an orb, and a cross. Whereas Browne's Paris is mediaeval, his London is relatively modern, and — despite the dome and steeples — focussed on commerce rather than religion. Although Browne has not shown the quarter-mile of embankment and its buildings in any detail, one may note that, to either side of Wren's dome, rise the steeples of three churches, all of which approximately date from the period of the Glorious Revolution, the cornerstone of eighteenth-century England's parliamentary democracy. Stretching from the sites of the modern-day bridges of Blackfriars (left: 1769) to Southwark (right: 1819), the Thames shoreline is cluttered with wharfs and piers. From the left to the right, the spires (see Pevsner) probably belong to the following churches, all designed by Sir Christopher Wren: St. Martin Ludgate (1677-87) in the background; St. Andrew-by-the-Wardrobe (1685-95); St. Benet Paul's Wharf (1677-85); St. Nicholas Cole Abbey (1671-81); St. Mary le Bow (1670-83) well back; and St. James Garlickhithe (1674-87). The ramshackle London scene in the foreground is strongly characterized by bales (left), barrels, and a lighter (right), indicative of mercantile activity and material prosperity, but has no figures, in contrast to the Paris scene at the bottom of the wrapper vignette. England has already experienced its political and economic revolution, Phiz implies, but France is yet to participate in renewal through revolution, imprisoned in the Dark Ages still by a malignant interaction of superstition, religion, absolutism, and privilege. Pevsner, Nikolaus. The Buildings of England: London I: The Cities of London and Westminster. Harmondsworth: Penguin, 1957. Sanders,Andrew. The Companion to A Tale of Two Cities. London: Unwin Hyman, 1988.